Schedule and venues of job fairs (October to December 2014) - Balita Boss! Department of Labor and Employment (DOLE) Secretary Rosalinda Dimapils-Baldoz annoucned recently the job fairs during the Christmas season, which promise thousands of decent job matching opportunities for graduates and other jobseekers. The Public Employment Service Office (PESO) is a non-fee charging multi-employment facility or entity established or accredited by DOLE in Local Government Units (LGUs), State Universities and Colleges (SUCs), Non-Governmental Organizations (NGOs), Community Based Organizations (CBOs), pursuant to Republic Act 8759 otherwise known as the PESO Act of 1999, and its Implementing Rules and Regulations. The PESOs are linked to the Regional Offices of the Department of Labor and Employment (DOLE) for coordination and technical supervision, and to the DOLE Central Office, to constitute the National Employment Network. 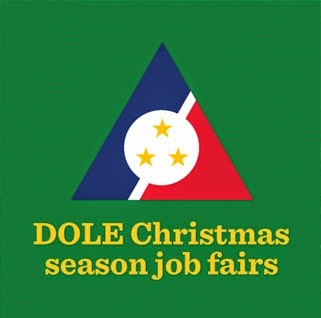 Here is the Schedule and venues of DOLE job fairs this Christmas season, from October to December 2014. NATIONAL CAPITAL REGION (NCR): October 8 – Job Fair at Trinoma, Activity Center, Trinoma Mall, Quezon City; October 10 - Mega Job Fair at Caloocan City Hall North, Caloocan City; October 23 – Mini Job Fair at Amphitheater, Malabon City Hall, Malabon City; October 28 – Community-Based Job Fair at Baseco Compd., Port Area, Manila; and October 29 -Magnus Eventus Inc. Job Fair also at Trinoma Mall Activity Center. CARAGA: October 18 – FSUU Job Fair at the FSUU Gymnasium, Butuan City. CARAGA: November 16 – The ABS-CBN Job Fair at the FSUU Gymnasium, Butuan City sponsored by ABS CBN-CARAGA. REGION X: December 10 – Job Fair at the SM City Car Park, Cagayan de Oro City sponsored by DOLE Region X; and December 19 – Hapsay Job Fair at the City Tourism Hall, Cagayan de Oro City. The tentative fair schedules are available at the Phil-JobNet link of the Bureau of Local Employment at www.phil-job-net.